Ducati or Kawasaki? Who will become the most successful manufacturer at Motorland Aragón? Chaz Davies carried the flag for Ducati in Aragon: he made the Italian manufacturer one of the two most successful around this track with Kawasaki winning 5 times for the Borgo Panigale squad here. Davies won for Ducati in 2015, Race 2; scored the double in 2016 and won again in Race 2 in the last two weekends here in 2017 and 2018. Ducati is also the team to beat in qualifying in Aragon, having recorded pole in 2017 and 2018. Moreover, Ducati recorded 7 of their 13 podiums here in the last two race weekends run at this track. Kawasaki is level with Ducati as the most successful team here, with five wins: they have an edge on podium finishes though, 17 to Ducati’s 13. Since the second 2013 race, at least one Kawasaki rider has climbed on the podium in each of the 11 races run here. The last podium with no Kawasaki on came in 2013 Race 1, when Sykes had to retire, and Baz was 5th. 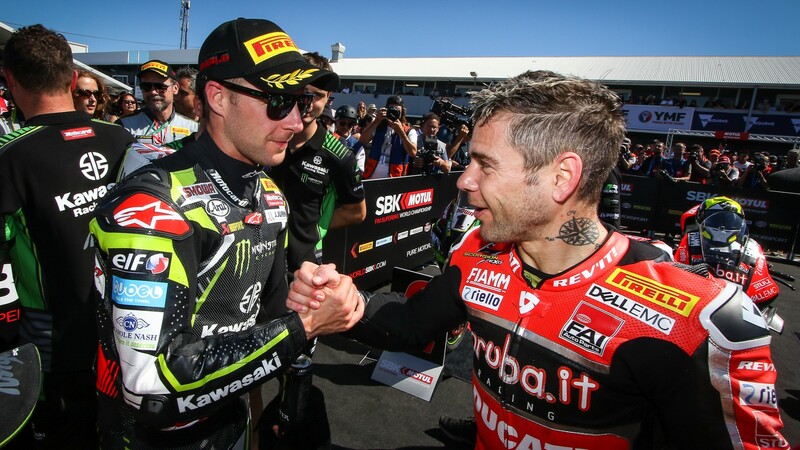 The obstacle for Kawasaki success in Aragon has been Chaz Davies: no less than five times a Kawasaki rider finished second to Davies here (Rea in 2015 Race 2, 2016 Race 1, 2017 Race 2, 2018 Race 2; Sykes in 2016 Race 2). Thanks to Tom Sykes, Kawasaki is the only manufacturer with four Superpoles in Aragon: (2012 to 2014 and 2016). The first weekend here, in 2011, is the only one without a front row place in qualifying for Japanese manufacturer. BMW won three times in Aragon (and it is the only track in which the German manufacture won three times), the second-best number behind the five by Kawasaki and Ducati. Marco Melandri won Race 2 in 2012 and Chaz Davies scored the double the following year. Last year Loris Baz was 11th and 15th for BMW here. In 2011, with Marco Melandri, Yamaha managed a win from pole in Race 1 and a second place in Race 2. In the last two seasons, Yamahas have finished just off the podium, recording two fourth places (Lowes in Race 1, 2017; Race 2, 2018) and four fifth places (with Van der Mark in all the four races). Honda finished on the podium only once at Aragon, with a third by Jonathan Rea in the first 2014 race. Last year they were hit by bad luck as Leon Camier had managed a 9th on the grid (the best qualifying result for Honda in Aragon since the 5th by Rea in 2014) but was involved in a racing accident in Race 1 and had to withdraw from Race 2. Jake Gagne was the best Honda rider: he was 12th in both races. Honda won on 30 different tracks in its history: Aragon is one of the 10 tracks where they climbed on the podium but have yet to win. Find out who will prosper and who will struggle this year at MotorLand Aragón with the WorldSBK VideoPass.